What value do you place on a museum visit, that is free of charge, and yet depends on donations to support its running costs? Will increasing the visibility of the museum’s donation cases, increase the frequency of donations, or even the amount donated? 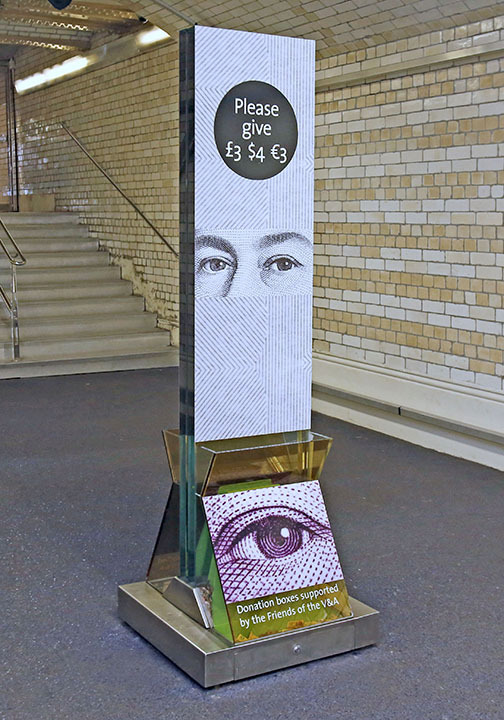 The Eyes Have It First donations case intervention at the V&A. According to psychology research, people become more co-operative when they sense they are being observed, and are more likely to conform to social rules when they feel they are being watched. The Eyes Have It uses images of the Queen’s eyes, enlarged from the £5 and £20 banknotes, as an experiment to see if this idea has a positive effect on the request for donations to the museum. Hey Big (Red) Spender! Second donations case intervention at the V&A. Research suggests that the colour red has a physiological effect on the human body, increasing our heart rate and raising testosterone levels in men. These effects can make us spend more money. Hey Big (Red) Spender! puts this theory to the test using macro photographs of the patterns printed on the £50 banknote. Growing Donations Third donations case intervention at the V&A. Evidence indicates that the presence of flowers inclines people to be more generous. 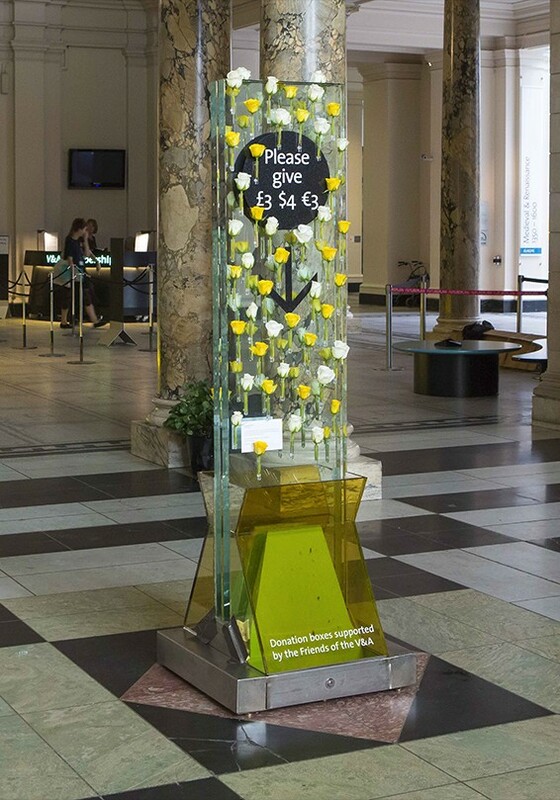 Growing Donations covered the V&A’s Grand Entrance donations case with one hundred yellow and white roses, each flower head in a glass test tube, in order to trial this theory around charitable giving and cultural value. 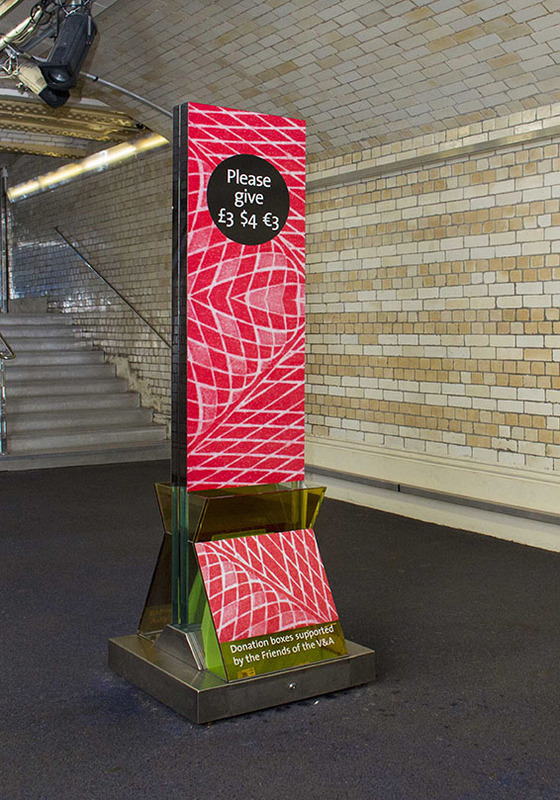 Photographs by Jonathan Rowley, with kind permission from the Bank of England.